The growth of the mobile app development industry is just incredible, in a little over 3 years, more then 20 billion apps have been downloaded between the iPhone and Android devices. The Android platform owns about 47% and the iPhone owns about 29% of the U.S. smartphone market. 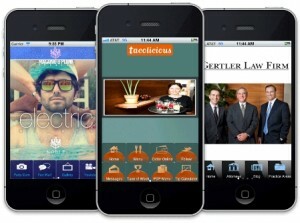 Rave Review offers both mobile app development along with mobile website design and development. Your mobile app’s can appear in the iTunes App Store or Android Marketplace or both, and we can mobilize your existing website. We are a complete mobile marketing solution for your business. Why Use Rave Review For Your Mobile App Development? We make the mobile app development and the mobilization of your business simple and pain free. This will help bring you new business and increasing repeat customer loyalty. Some Of The Things That A Mobile App Can Display? As well as many other great features! Interested in having your responsive website converted to an Android and/or IOS App with push notification affordably?